Mississippians will head to the polls on Tuesday, November 3rd to decide whether they want to amend the State Constitution. On the ballot is the citizen-led Initiative 42. If it passes, supporters claim the proposal would increase funding for public schools and improve educational outcomes for Mississippi students. Detractors say the amendment could bust the budget and open the state up to numerous lawsuits. 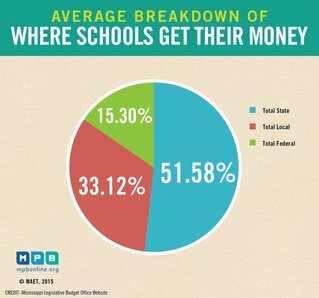 So, how does school funding currently work in Mississippi? The Mississippi Adequate Education Program - MAEP - is the formula that dictates how much lawmakers are supposed to put towards K-12 education each year. Republican Representative John Moore is Chair of the House Education Committee. "It's going to be the first thing that a lot of people are going to be concerned about," says Moore. Adopted in 1997, MAEP was designed to ensure that children in Mississippi get an adequate education whether they live in a wealthy or poor community. During this year's legislative session, lawmakers approved a budget that appropriated more than $2.2 billion towards the program. "It's a huge part of the budget, " Moore says. "Between it and Medicaid they consume a mass of the monies appropriated every year." But how is the MAEP formula calculated? This document from the Mississippi Department of Education explains the complicated formula. Essentially, it uses the average amount of money it takes to operate a C-grade school district to determine what's called the base student cost. That number is then multiplied by a district's average daily attendance, or the number of students who show up to school during a two-month period, during the previous school year. And to combat the educational impact of poverty, extra funds are appropriated based on the number of students who receive free-and-reduced lunch. Then add-on's are included. They're special funds dedicated to certain programs like special education, gifted programs, and transportation. "That added to the formula becomes the total MAEP allocation for a school district," says Todd Ivey, chief operations officer for MDE. 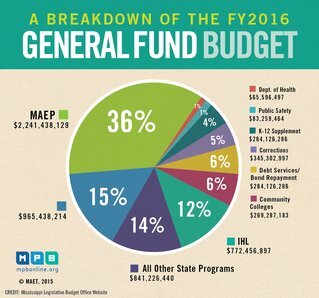 But according to the State Superintendent's report from last year, on average, MAEP only accounted for about half of a district's total revenue. The rest is made up from local taxes and the federal government. This is where a divide in funding exists between districts with high total property values and those with low ones. "You can take a school district who's value of a mill is $20,000, and we have some school districts who's mill value is that low," Ivey says. "Well, you're levying 50 mills, at $20,000 a mill. What's the math? A million dollars. That's all the money you're bringing locally, which in the great scheme of things is not a lot of money when compared to a school district who has a mill value of a million dollars." But that's not the only state funding that goes to K-12 education. Lawmakers also approved roughly $245 million outside of MAEP for things like pre-k programs and literacy coaches to help address the third-grade reading gate. 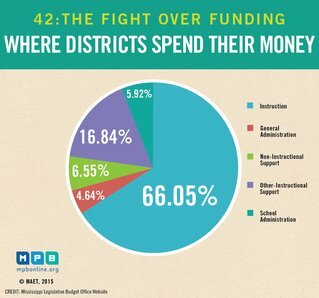 However, those dollars are program specific and do not go to every district. And while total K-12 funding actually exceeds what MAEP calls for, some lawmakers say it's still not enough. Retiring Representative Cecil Brown, a Democrat from Jackson and former Chair of the House Education Committee, says state K-12 funding from outside of MAEP is still lacking. "To some extent that's true, but a lot of that money, even from the state now, is designated for specific programs," Brown says. 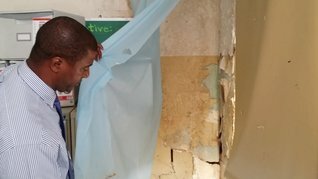 "It doesn't help for building repairs. It doesn't help buying new books new computers for the average classroom teacher. It doesn't help for laboratory equipment for biology labs. Those types of things." 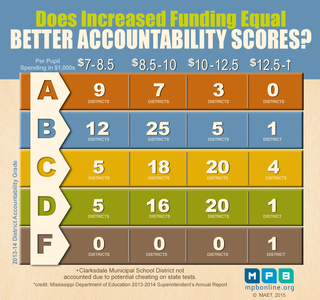 The Mississippi Adequate Education Program itself also has its fair share of critics. State Auditor Stacey Pickering issues an annual report that questions the efficiency and transparency of MAEP. "The numbers that go into the funding formula are so convoluted," Pickering argues, "they're pulled from different areas. Some of those numbers literally can't be audited. The way we identify at-risk children in Mississippi is based on the free lunch program. USDA, they don't audit that. We've gotten the letter from them telling us to cease and desist, not to audit those numbers. So we can't even validate that that number is accurate." Pickering says changes need to be made to the formula to make it more effective. But Education Committee Chair John Moore says that may not be in the best interest of the state. "Any change that we make, we don't want it to be detrimental to the system," Moore says. "That's why I have been very careful to kind of stay off of the formula and not throw it out and say 'Okay, we're just going to go write a new formula.' I'm not in the mood to do that." Since its inception, lawmakers have only voted to fully fund the Mississippi Adequate Education Program four times, in 2003, 2008, 2009 and 2010. But due to revenue constraints during the 2009 recession, funding for the program was cut mid-budget year. Since then, it has remained underfunded to the tune of about $1.5 billion over the last seven years. Using the tabs below, see what the Initiative 42/Alternative 42-A ballot looks like. Then choose the tab with your preferred outcome to see which bubbles to select for that result. School districts in Mississippi spent on average $9,200 per pupil last year. According to the National Center for Education Statistics, the amount places the state near the bottom compared to the rest of the nation. Some public school advocates in Mississippi blame the relatively low amount of funding for many of the woes facing the state's education system. But many lawmakers say schools are not using the money efficiently. 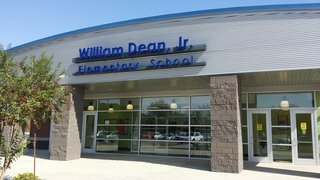 It's midday at William Dean, Jr. Elementary School in Lexington and students are beginning to line up for lunch. The school is the newest addition to the Holmes County District, and Superintendent Powell Rucker is proud of it. “These classrooms are about 900 square feet,” says Rucker, pointing out the relatively spacious nature of the new school. Just one county south of Holmes, conditions could not be any more different. Madison County is home to the state's 5th-largest school district. It spends slightly less than the state average of $9,200 per pupil. It's also regularly ranked among the highest performing districts in the state. Despite its success, Madison faces a potential budget problem. All of its state support goes towards paying teachers, and the district has nearly reached the limit on how much money it can draw from local taxes. What does matter is the kind of community the school district serves. In 2013, 12.7 percent of residents in Madison County lived below the federal poverty line. During the same year, more than 43 percent of Holmes County residents lived in poverty. Local support, in the form of property taxes, also plays a large part in the success of a district. During the 2012-2013 school year, Madison County was able to fund nearly half of their operating budget from local taxes. For Holmes County, local support amounted to less than a quarter of the budget. Lawmakers in Mississippi appropriated nearly $2.2 billion last year to fund the Mississippi Adequate Education Program. While the program received a record amount of support from the state, funding still fell short more than $200 million for the seventh year in a row. Supporters of Initiative 42 claim the proposal would force the legislature to increase funding for schools and, in turn, improve educational outcomes for students. For the most part, many of the houses McNeal approaches quietly accept the pro-42 literature, close the door and she moves on to the next house. She is just one of the hundreds of volunteers who have donated their time canvassing neighborhoods, working phone banks and putting up signs urging Mississippians to vote for the amendment. But that's just one aspect of the campaign to pass Initiative 42. 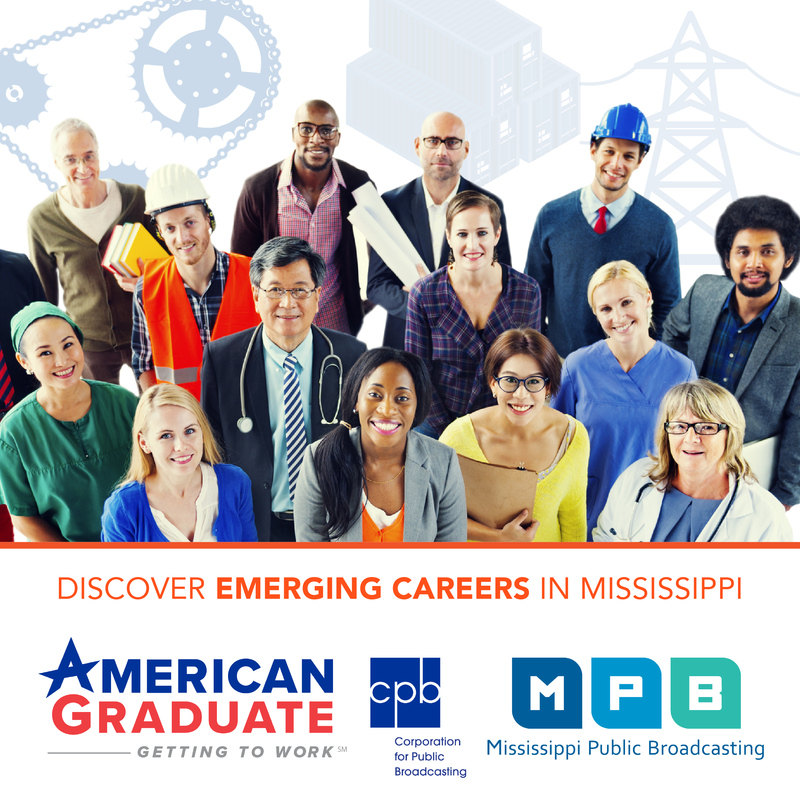 Over recent weeks, Mississippi airwaves have been plastered with commercials. Through the amendment process, Initiative 42 would change section 201 of the Mississippi Constitution by adding the phrase "the State shall provide for the establishment, maintenance and support of an adequate and efficient system of free public schools." The proposal would also give the state's Chancery courts the power to provide injunctive relief. In other words, if lawmakers fail to fully fund public education, individuals would be able to sue the legislature forcing them to put more money towards schools. But lawmakers have characterized 42 as an effort to wrestle control of public education policy away from elected officials in favor of the state's Chancery courts. They've also maintained that fully funding the Mississippi Adequate Education Program all at once would put a strain on the state's budget. Lawyers who helped craft the amendment say they've taken that into consideration and included language on the petition that would allow lawmakers to phase in funding over a period of time. Jackson attorney Luther Munford says it's unlikely a judge would not take that intent into consideration. "It is absolutely standard constitutional interpretation to look at the text, to look at the legislative history and to look at the case law," Munford says. "We think that if a judge says 'Well, the 120,000 people who put this thing on the ballot want a phase-in process, that sounds like a pretty good idea.' That's what the intent was." In recent weeks, some retired state Supreme Court justices have spoken out in agreement with Munford's legal assessment of Initiative 42. Yet, detractors remain unconvinced, arguing that in order to meet financial demands the state would have to raise taxes which could potentially hurt the economy. And that's the point many people with the 42 for Better Schools campaign are trying to make. They believe the state, as a whole, has suffered because schools have been underfunded, and Rejebian says Mississippians are tired of it. “Parents, educators, republicans, democrats, just a cross-section of Mississippi just got fed up with it and said ‘enough is enough',” he says. While the effort to pass Initiative 42 has garnered a lot of support from public school advocacy groups around the state and nation, many Republican leaders have questioned the validity of the amendment, instead believing it to be an attempt to wrestle control of the state's education system away from elected officials. 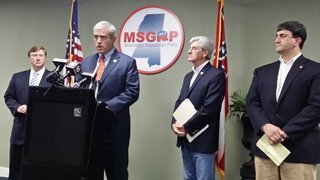 It's a somewhat uncommon sight to see, three of Mississippi's top Republican leaders gathered together for a joint press conference. But over the past week, Governor Phil Bryant, Lieutenant Governor Tate Reeves and Speaker of the House Philip Gunn have been traveling around the state in an effort to sway voters against Initiative 42. 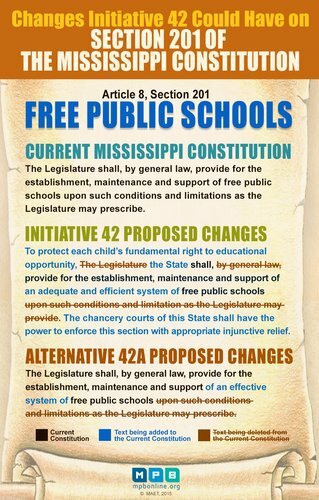 42 seeks to change section 201 of the Mississippi Constitution by requiring lawmakers fund an "adequate and efficient system of free public schools." If lawmakers fail to do that, individual residents would be allowed to sue them in Chancery Court. Under state statute lawsuits against the state must be filed in Hinds County. Gunn says it's not fair to people who live in Mississippi's other 81 counties. “People in [the rest of] the state don’t get to vote for judges in Hinds county, so people ought to be very concerned about that,” he says. There's also concern that 42 could wreak havoc on the state budget. Last year, lawmakers put about $2.5 billion into total K-12 funding. Most of it, about $2.2 billion, went to the Mississippi Adequate Education Program. Another $245 million was funded outside the formula. That accounts for nearly 40 percent of the state's general fund budget – the portion of state spending lawmakers actually have control over. And with state support of Medicaid expected to surpass $1 billion next year, lawmakers say other state agencies would face a 7.8 percent cut in funding. That could lead to layoffs across state government and even into institutions of higher learning like the universities and colleges. 42's supporters argue the petition that put the amendment on the ballot in the first place included a plan that would allow lawmakers to phase in funding using 25 percent of new revenue growth to address funding issues. But lawyers like Russ Latino with Kids First Mississippi – a conservative group formed to oppose the initiative – say it's not just about funding. They believe it could open the state up to additional lawsuits. In order to protect the state from the potential pitfalls of the Initiative, lawmakers presented their own alternative, 42-A. Crafted earlier this year during the legislative session, the alternative would require lawmakers to maintain a system of "effective public schools." The alternative will appear next to 42 on the ballot. Supporters of 42 claim the alternative is merely an attempt to confuse voters by making the ballot overly complicated. 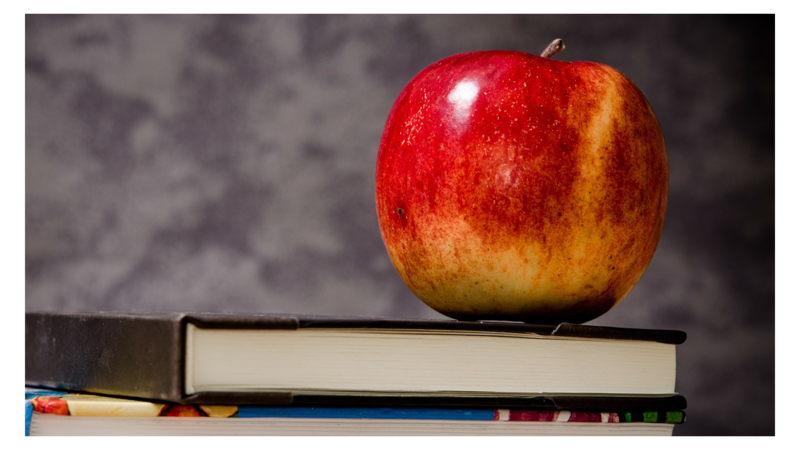 Despite the criticism of 42, conservative lawmakers have unequivocally stated that they do believe state support of K-12 education needs to be increased. They don't believe Initiative 42 is the way to do it. 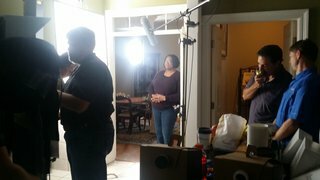 It's a quiet day in the Jackson suburb of Brandon, but in one neighborhood, film crews are hard at work shooting a commercial that urges voters to support Initiative 42. By now, you've probably seen the ad on TV; along with several others for-and-against the initiative. The ads have been airing ad nauseam for weeks, but Patsy Brumfield with 42 For Better Schools says it's for a good reason. The fight over Initiative 42 has been brutal and with many statewide office races already a foregone conclusion, big money has entered into the equation. According to the Secretary of State's website, two of the main groups opposing the amendment have received about $400,000. And the list of donors reads like a who's who of conservative politics. Lobbyists like the Mississippi Manufacturers Association and the Mississippi Farm Bureau as well as the Governor, Lieutenant Governor and Speaker of the House have donated to anti-42 political action committees. The 42 For Better Schools campaign, on the other hand, has brought in about $1.7 million this year from various parties in the state. However, the largest contributions to the campaign have come from groups like the New Venture Fund and Southern Education Foundation. Anti-42 groups have used those last two donations as a weapon, criticizing the 42 campaign for being a liberal assault on Mississippi's Constitution. The two campaigns have also been hurling accusations at one another for months. Opponents of the initiative have labeled it a liberal takeover of schools, one that would take power away from elected officials in favor of the courts. Leaders and anti-42 advertisements have often repeated the refrain, “a Hinds County judge,” in reference to the court that would first hear a case brought against the state government. But supporters of 42 have characterized opponents concerns over budget cuts and potential government layoffs as fear mongering. They point to a section of the petition that placed 42 on the ballot that would allow lawmakers to phase-in the funding over a period of time. Mississippians will decide the fate of Initiative 42 on Tuesday. Polls open at 7 am and close at 7 pm.